Reder Landscaping is the company you trust to keep your lawn and landscape beautiful and healthy in the spring, summer and fall. Now you can trust us when it’s all covered with snow. We watch the weather so you don’t have to! We will be there to plow every 1.5 – 4″ of snow fall. If snow fall is under 1.5″, we may suggest plowing based on snow density, moisture content, and freeze/thaw conditions. If you need it and approve, we’ll be there! Hand shoveling up to 200 sq. ft. is included with every contract at no additional charge. 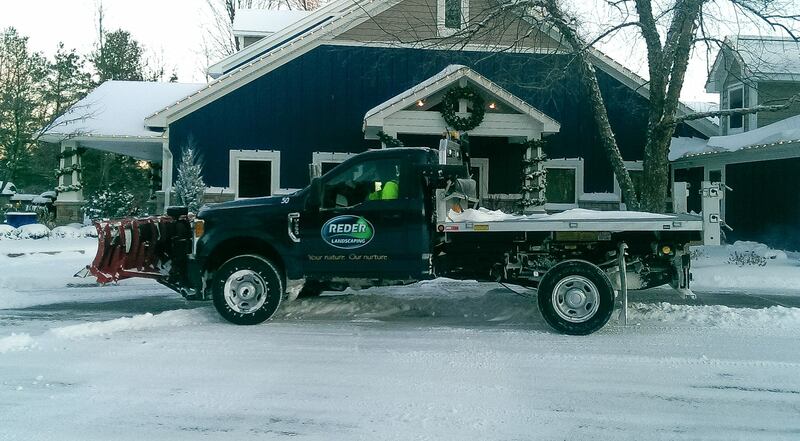 24/7 Emergency Services available to customers via our Snow Hotline: snow@rederlandscaping.com. Looking for a snow removal contractor and most importantly a local snow plow company that will be responsive when the snow hits the ground? We receive phone calls frequently from residential and commercial clients not happy with their snow removal contractors due to lack of response time. Our snow plow company understands that prompt snow removal is critical for all our residential and commercial snow removal clients. Our large fleet of snow plow trucks has the capacity to meet our customers’ needs so they do not wait long for snow removal. Already a snow removal customer and need help? If you have questions about our snow plowing or snow removal services, don’t worry! One of our snow removal professionals will walk you through the entire process. We look forward to working with you!